on January 8, 2018, 8:22 p.m. The rise of online streaming services has revolutionized the media industry. Faced with an eclectic mix of media providers, consumers have the power to unlock thousands of TV shows, films and/or music in seconds. The success of such companies has surprised many in the scope of both their popularity and their profit. Netflix, a pioneer of the TV and film streaming industry, is approaching 110 million subscribers worldwide. Online music streaming service Spotify is now worth more than the entire US music industry, with an estimated value of $8.4 billion. New research from YouGov Omnibus shows just how rapidly media trends are shifting in Saudi Arabia and the UAE. In the past 12 months 29% of consumers across both countries say they have increased the frequency with which they listen to music using online streaming services. This trend is strongest in the UAE, where the figure rises to 35%. 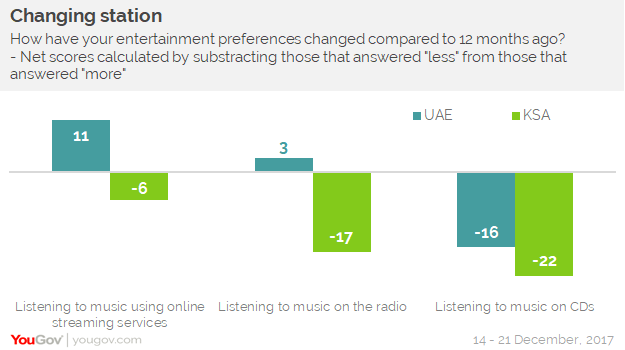 By contrast, just 24% of UAE consumers don’t listen to music using online streaming as much as they used to. The net increase (+11) shows the strong growth of online music streaming services in the Emirates in the past year alone. Other means of listening to music have suffered as a result. A third of consumers in Saudi Arabia claim to listen to the radio less than they did 12 months ago, while in the UAE 28% have tuned in less. However, CDs have seen the biggest plunge in popularity; 35% of consumers in both countries have played CDs less in the past year. Overall, a third (34%) of online consumers across both countries have subscribed to a music streaming service at some point. Of those who have previously subscribed to such a service, half (52%) still have a subscription. Interestingly, the study shows once customers change digital music service providers, it’s hard to entice them back. When propositioned with better sound quality, respondents claim they are more likely to stick with and pay more with their current provider (79%), whereas fewer (64%) would return to and pay more with their previous provider. Much like music, consumers are also increasingly using subscription services to watch video content. As many as three in ten (29%) across both countries say they watch video content on platforms that do not require payment and/or a subscription, while a quarter (26%) pay to watch video content via streaming services more than they did a year ago. Yet broadcast TV remains popular; nearly a third of consumers across both countries (30%) say they watch more live TV more than they did twelve months ago. Data collected online by YouGov Omnibus among 1,002 respondents in Saudi Arabia and 1,114 respondents in the UAE between 14 and 21 December 2017 using YouGov’s panel of over 5 million people worldwide. Data is representative of the adult online population in both countries.